In this article, we will explore the Expanded Universe or simply the EU. The EU consists of books, video games, and comic books and kept the mythos of Stars Wars going forward, especially during the dark times. The dark times, was the period of time when there were no new movies produced. During this period Lucasfilm decided everything that came out, whether it was a video game, a comic book, or a book, was all considered canon. The first book written was Star Wars: From The Adventures of Luke Skywalker. The book was a novelization of the Star Wars movie, written by George Lucas and ghost written by Alan Dean Foster. The first non-movie novel released, was Splinter Of The Mind’s Eye, written by Alan Dean Foster in 1978. Lucas requested Foster to write the book for the purpose of a sequel to Star Wars. Lucas wanted a plan in place; if Star Wars failed at the box office, he could make a low budget sequel. Harrison Ford was signed to only one movie; therefore, Lucas was not sure if he would come back. Consequently, the Splinter Of The Mind’s Eye did not include Han Solo and Chewbacca. The story’s focal point was Luke Skywalker and Princess Leia’s mission to recruit a planet to the Rebel Alliance. On their way to persuade the planet to join the alliance, they crash landed on a swampy and foggy planet of Mimban. Sound familiar? Mimban was the inspiration for Dagobah in The Empire Strikes Back. On the planet, Luke is attracted to a red crystal. Get ready! That’s right, it’s a Kaiburr crystal. Lucas had Kaiburr crystals in mind since the beginning. (We will cover that in a future article). The Splinter Of The Mind’s Eye was barely considered canon in the EU, and that’s saying something. There are plenty of things that will make you scratch your head. Luke and Leia have a romantic relationship and they have a mud fight (really)! Luke is amazing at wielding a lightsaber; he severs Darth Vader’s arm off and, speaking of lightsabers, Luke and Vader both fight with blue lightsabers. Like I said, you will be scratching your head. Even with the canon issues, Splinter Of The Mind’s Eye is an important book. It’s the first story outside of the movie and it begins the Star Wars Expanded Universe. After Splinter Of The Mind’s Eye, eight more books were written. Six books were original stories and the other two were The Empire Strikes Back and Return Of The Jedi. The last book was published in December of 1983. Of the six new stories written, three were about Han Solo and three were about Lando Calrissian. This period is sometimes referred to as Classic Star Wars. The next book in the EU would not be published until June 1991. Can you believe that? Seven years and seven months later! At a time when everyone was looking for any morsel of information, when there was no internet to connect to other fans, and there was no twitter to get official news from Lucasfilm. We had nothing. This was the darkest time to be a Star Wars fan. For all we knew, Star Wars was done forever. Then, like a shooting star, the Expanded Universe would begin with a bang. In June 1991 Timothy Zahn published Heir to the Empire, the first book of his new trilogy. 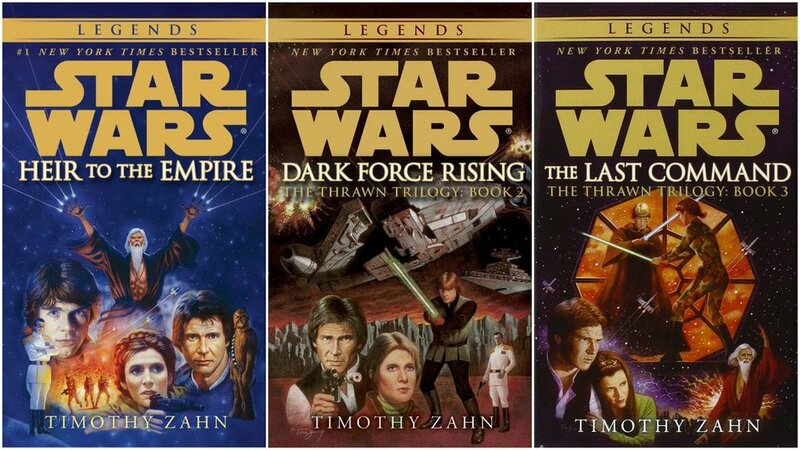 In the following two years, Dark Force Rising and The Last Command finished off what would come to be known as The Zahn Trilogy. The new trilogy was set five years after the events of Return of the Jedi. The Rebellion, now the New Republic, has pushed the remnants of the imperial Starfleet to the edges of the galaxy. Princess Leia and Han Solo are married and expecting Jedi twins and Luke Skywalker has become the first in a long-awaited line of Jedi Knights. However in the far reaches of universe, the last of the Emperor’s warlords, Grand Admiral Thrawn, has taken command of the shattered Imperial fleet, prepared for war, and launched a massive campaign aimed at the New Republic’s destruction. Thrawn discovered the Dark Jedi C'baoth and pointed him towards Luke Skywalker. This discovery could destroy everything the Rebel Alliance fought so hard to build. C’baoth was driven to turn and train Luke, Leia, and Leia’s unborn twins. As Thrawn begins his final siege, Han and Chewbacca struggled to form a coalition of smugglers for a last-ditch attack against the empire. Leia holds the Alliance together and prepares for the birth of her Jedi twins. Overwhelmed by Thrawn's attack, the Republic has one last hope -- sending a small force, led by Luke Skywalker, into Thrawn’s stronghold. There, a final danger awaits, as the Dark Jedi C’baoth directs the battle against the Rebels and builds his strength to finish what he had already started: the destruction of Luke Skywalker. The trilogy introduced many new characters. To this day the characters of Thrawn, Talon Karrde and Mara Jade, remain fan favorites. The Imperial capital world of Coruscant, was given its name by the trilogy, and would later be featured in the prequel films. These books, to many fans, served as the next trilogy (7-9) in the Star Wars Saga. Today there are a group of fans who still refuse to see The Force Awakens, because it does not follow the events in the Zahn trilogy. The Zahn trilogy was the big push to Expand the Universe. In the next 22 years over 270 adult novels were written. Another popular novel of the EU, was Shadows Of The Empire. 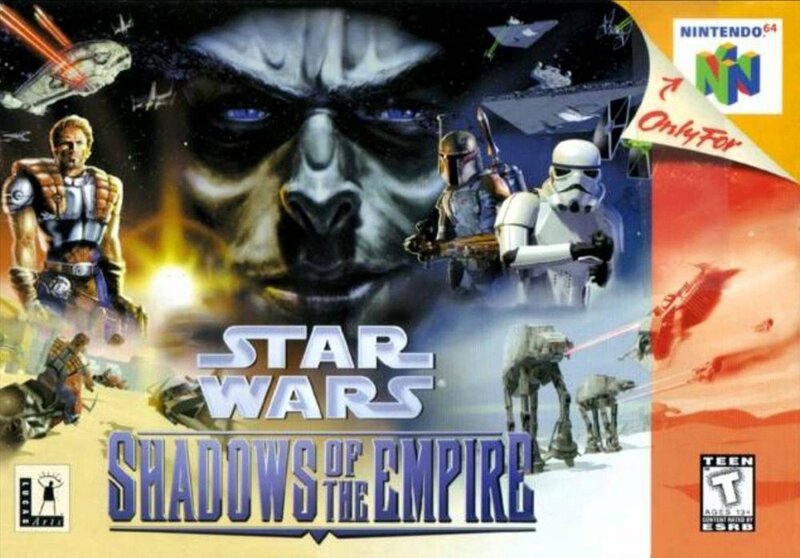 Shadows Of The Empire was a multimedia project created by Lucasfilm in 1996. There was a novel, comic books, a soundtrack, a video game, and action figures. The novel was written by Steve Perry. Shadows Of The Empire took place in between The Empire Strikes Back and Return Of The Jedi. It follows the adventures of Luke, Leia, Chewie and Lando, as they begin a plan for rescuing Han Solo. It also shows the reader the emotions of Luke dealing with the bombshell that Darth Vader dropped on him. Luke has not heard from Obi-Wan and is trying to figure out if Vader is lying or if he really is his father. As for Leia, she had the man she loves taken away from her and will go to any length to get him back. Lando wants to prove his loyalty to others , and Chewie is just angry. Along the way we are introduced to new characters like Dash Rendar and Prince Xizor. Shadows became a fan favorite. Many in the Star Wars community would like to see this story turned into a movie. Do I smell a future article brewing? The last highlight of EU that I am going to talk about is The New Jedi Order. The New Jedi Order is a 19 book series written by different authors between the years 2003 and 2011. In the series we see Luke Skywalker usher in a new order of Jedi. These new characters would feature prominent roles in the story. Of course the biggest storyline was the alien invasion called the Yuuzhan Vong war. The Yuuzhan Vong were aliens not known in the Star Wars universe who first attacked and destroyed the Outer Rim. If you are fan of the prequel movies then you know every planet is in the Outer Rim (wink). When the story was conceived, George Lucas worked with creators. They expressed the interest in killing off a major character. They first asked to kill Luke Skywalker. George said no, and also told them that C-3PO and R2 were off limits. The story creators decided to kill ( S P O I L E R ) Chewbacca. One of the reasons that this story arc did not work for the community, besides killing Chewbacca, is that it was hard to get into. If readers did not start from the beginning, they were overwhelmed. Depending when they entered they would have to buy all the books that preceded the title they bought. The Last Book of the EU was published in 2013. In April 2014, nineteen months after Disney bought Lucasfilm, the EU turned into Legends. They would become non-canonical stories of Star Wars. Many fans were upset with the loss of the EU. The biggest reason for Disney abandoning the EU, was the death of Chewbacca. Why would Disney not want Chewie available for movies, and cartoons? It makes sense to reboot. I love and appreciate many of those stories, but I understand Disney wanting a clean canvas. As I said before there were over 270 novels and that does not count young adults, comic books and video games. There are too many tales filling the periods in between the movies. Now Disney gets to tell more stories without ruining canon. These stories can be told in movies like Rogue One and Han Solo, cartoons like Rebels, and of course, books. To be fair I am not exactly thrilled with Disney’s new EU books, but we will get into that some other time. Last year Disney brought back a Legends character, Thrawn. He was introduced in the first episode of Star Wars Rebels Season 3. Later in 2017, a Thrawn novel was released written by, you guessed it, Timothy Zahn. In 2018 a second novel about Thrawn was released. Also, the planet Mimban that was featured all the way back in 1978 in Splinter Of The Mind’s Eye is in the new Han Solo movie, and The Tie Defender, an imperial ship from the TIE Fighter video game, has appeared in Rebels. Disney will continue to bring characters, places and ships into the new EU. They would be silly not to. Star Wars fans cling to connections and Disney knows that. Those of you who have made it to the end, thank you for lasting this long. I hoped you enjoyed a look back into the EU. I will see you next time at the Cantina, I’m buying!